Roasting marshmallows around the campfire is synonymous with every great summer. While we often take the process for granted, there are many safety issues surrounding setting up and maintaining a safe fire for everyone. Open campfires must be used wisely. Even a small campfire can potentially become a dangerous and unmanageable wildfire. 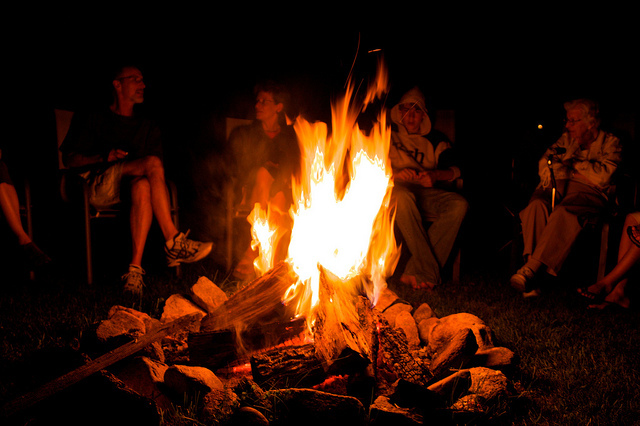 Follow these tips for a safe fire at your cottage or campsite this summer. Use the stove, ring or pit provided for a fire. These fire facilities are located and designed to prevent a campfire from spreading to nearby forest cover. If a previous fire pit exists, use it to avoid creating a new fire scar. Never build a fire on mossy areas, dead logs or tree roots. Select a site on level ground that is sheltered from high wind and well away from heavy brush, live trees and overhanging branches. Ensure there is a convenient source of water nearby for extinguishing the fire. Dig up a square piece of sod, roughly 45 cm x 60 cm. Keeping it as intact as possible, lay it to one side. Remove the remaining topsoil down to mineral soil (which has no organic material). Pile the topsoil nearby. Make one end of the pit slightly deeper to accommodate cooking waste. Use only dead wood found lying on the ground. Dry areas under large conifers are good spots to find kindling material. Never use gasoline or lighter fluid to start your fire. Keep your fire as small as needed for cooking and warmth. Stop adding fuel well before you plan to put the fire out. The psychological and emotional effects caused by fire burns can be far reaching for the victim. Exercise these 12 easy tips so your friends and family can relax around a peaceful fire pit without any worry. If you have been in an accident due to fire negligence, we will listen to the circumstances leading to your injury and treat you with compassion as we determine the next steps to assist you.